Scala is my current favorite general-purpose programming language. However, it definitely has its share of flaws. While some are deep trade-offs in the design of the language, others are trivial, silly issues which cause frustration far beyond their level of sophistication: "warts". This post will explore some of what, in my opinion, are the warts of the Scala programming language, to hopefully raise awareness of their existence as problems and build a desire to fix them in the broader community. I think that Scala has a disproportionate ratio of superficial-warts to deep-design-problems. While many languages have a relatively clean superficial syntax and semantics that hides a crazy and unpredictable core logic, Scala in my opinion has a relatively elegant core logic that's overlaid by a gnarly, messy superficial syntax and semantics. Not every problem with a programming language is a "wart". Many problems arise from deep design decisions and trade-offs, where there often isn't a "correct" solution, or where proposed solutions often come with their own share of (often unsolved) problems. However, many problems are simply incidental. They exist for no particular reason, have no particular benefit for being around, and have "obvious" solutions that would be non-controversial. They really should have been fixed years ago, though the second best time to fix them starts today. Just because people complain about something doesn't mean it's a "wart". @ val x = "hello"
Haskell has an Eq type-class which seems like what we'd want: restricting comparisons only to types which it makes sense. The Scala people have come up with a similar-but-different idea in their Multiversal Equality proposal. The unsafe-ness of equality is a problem: making mistakes like this is very common in my experience. e.g. when refactoring a code to change Strings to an Id class, you can fix all the compile errors, but all the equality checks are now invalid, and without the compiler's help you need to go hunt them all down manually. Furthermore, I'm sure there is a solution out there that can make things better, but the solution isn't "trivial" or "obvious" enough to make me consider this a Wart. This also gives Scala all the constraints of the JVM: boxing everywhere resulting in unnecessary GC pressure, a disk-heavy binary format for classfiles and jars, and a tremendously slow startup time for any non-trivial program. However, the reliance on the JVM is deep enough to be a core feature of the Scala language. It's debatable whether Scala would have been able to achieve the success it has without piggy-backing on all the JVM has to offer. While it would be nice to slowly reduce that reliance, which is happening now with Scala.js and Scala-Native, it's a hard trade-off that I can't consider a Wart. You could erase even more, like in Scala.js, where even the top-level types are (partially) erased at runtime, meaning the above example runs perfectly fine without any errors! Lastly, it could be argued that having "Full" erasure helps enforce parametricity/encapsulation: you can no longer check what class something is when calling a method, and are thus forced to rely on whatever abstract interface you are provided with. Hence, I don't know what the correct answer is here. There are good arguments why both "more erasure" and "less erasure" are good things, so without a obvious better-way I don't consider this a Wart. @ val n3: Name = "hello"
@ val n3: Name = ""
While this behavior may be confusing, unintuitive and hard-to-debug sometimes, it also forms the basis for a large number of common Scala design patterns. Scala wouldn't be Scala without implicits. The actual implementation of implicits contains many strange corner cases, in addition to out-right bugs, but implicits themselves are so core to Scala that I don't think they could be considered a "wart"
Warts are somewhere on the spectrum between design issues and outright bugs. These are things that, I think, have obvious solutions that would be both easy and relatively uncontroversial to fix, that nonetheless cause annoyance and frustration disproportionate given how trivial the issue is. Scala maintains a distinction between "functions" and "methods": in general, methods are things you call on an object, whereas functions are objects themselves. However, since they're so similar ("things you can call"), it gives you a way to easily wrap a method in a function object called "eta expansion"
This is a bit strange to me. If I can easily convert the entire repeat method into a function without specifying any types, why can I not convert it into a function if I already know one of the arguments? After all, I have provided strictly more information in the repeat("hello", _) case than I have in the repeat(_, _) case, and yet somehow type inference got worse! Furthermore, there's a more fundamental issue: if I know that repeat is a method that takes two arguments, why can't I just do this? Unapplied methods are only converted to functions when a function type is expected. You can make this conversion explicit by writing `repeat _` or `repeat(_,_)` instead of `repeat`. After all, since the compiler already knows that repeat is a method, and that it doesn't have it's arguments provided, why not convert it for me? Why force me to go through the _ or (_, _) dance, or why ask me to provide an expected type for func if it already knows the type of repeat? Here, the weird (foo _) dance is something that they have to do purely because of this restriction in eta-expansion. While I'm sure there are good implementation-reasons why this doesn't work, I don't see any reason this shouldn't work from a language-semantics point of view. From a user's point of view, methods and functions are just "things you call", and Scala is generally successful and not asking you to think about the distinction between them. However, in cases like this, I think there isn't a good reason the compiler shouldn't try a bit harder to figure out what I want before giving up and asking me to pepper _s or expected types all over the place. The compiler already has all the information it needs - after all, it works if you put an _ after the method - and it just needs to use that information when the _ isn't present. After all, if getFoo() is a Int, why shouldn't getFoo without the parens be a () => Int? After all, calling a () => Int with parens give you an Int. However, in Scala methods are "special", as shown above, and methods with empty parens lists are treated even more specially. Is this really the behavior we expect in a statically-typed language, that you can call this method with any number of argument lists 0 < n <= 5 and it'll do the same thing regardless? What on earth is the type of bar? The Scala community likes to think that it's "definition-side variance" is better than Java's "use-site variance", but here we have Scala providing definition-site parens where every caller of bar can pick and choose how many parens they want to pass. I think the solution to this is clear: methods should be called with as many sets of parentheses as they are defined with (excluding implicits). Any method call missing parens should be eta-expanded into the appropriate function value. def head: T = ??? def next(): T = ??? val first1: T = thing.head   // Works! val first3: T = thing.next   // Works! val first4: T = thing.next() // Works! Notably, this does not take away the ability to control how many empty-parens a function is called with; rather, it shifts that decision from the user of a function to the author of a function. Since the author of a function already decides everything else about it (It's name, arguments, return type, implementation, ...) giving the author the decision over empty-parens would not be unprecedented. Note: The expected type requires a one-argument function accepting a 2-Tuple. Needing the strange case just to destructure a tuple. Can't the compiler see that it's getting a (A, B) => C function, needs a (Tuple[A, B]) => C function, and convert it automatically? Happily, both these limitations are slated to go away in a future version. However, right now they are definitely an unnecessary, trivial annoyance when writing Scala. res26: String = "hello 1"
It really shouldn't. In my experience, there extension methods are rarely ever used. If someone wants to use them, they can import the functions themselves or write their own extensions. 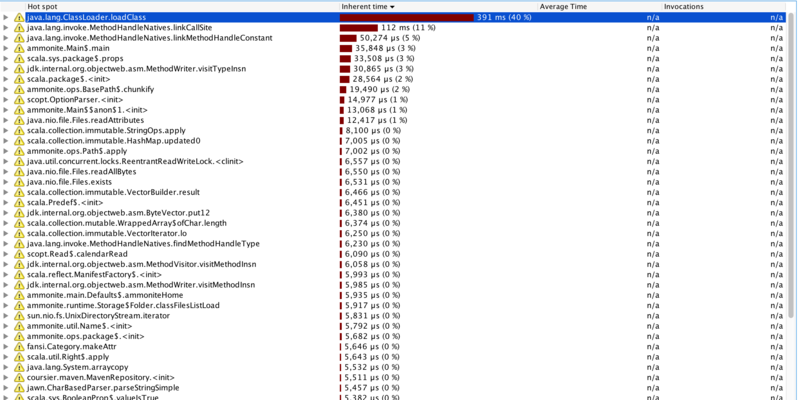 It doesn't make any sense to pollute the method-namespace of every value in existance to add some unused functionality. I have nicely formatted the desugared code for you, but you can try this yourself in the Ammonite Scala REPL to verify that this is what the for-comprehension gets transformed into. This is a convenient way of implementing nested loops over lists, and happily works with things that aren't lists: Options (as shown above), Futures, and many other things. You can also assign local values within the for-comprehension, e.g. Although it is roughly equivalent, and ends up with the same result in most cases, this output format is tremendously convoluted and wastefully inefficient (e.g. creating and taking-apart unnecessary Tuple2s). As far as I can tell, there is no reason at all not to generated the simpler version of the code shown above. <console>:4: error: '<-' expected but ';' found. As far as I can tell, "nobody" does any of this: people don't inherit from case classes, declare their case classes abstract, or rememebr to mark them final. Literally the only programmer I've ever seen making good use of abstract case classes and inheritance is probably Martin Odersky himself. I think we should disallow it, and just force people to use normal classes if they want to inherit from them. This one straddles the line between "Wart" and "Bug", but definitely should be fixed so that a class defined with one argument list doesn't magically sprout two. Did you know the presence or absence of comments can affect the logic of your program? As you can see, this code behaves differently if we have a line between the Foo bar and the baz, unless that line has a line comment on it! When there's no newlines or the newline is filled by a comment, Foo.bar(x: Any) gets called, and when there's a newline not filled by a comment then the other overload Foo.bar gets called. A full listing of the places where this "comment can change behavior of newlines" can be found in the OneNLMax rule of the ScalaParse grammar. I don't have an immediate answer for what the correct solution is here, but I'm 99.9% sure we should make it so comments like this don't affect the semantics of a Scala program! Currently, it assumes the latter, in all cases. That makes any sort of "destructuring assignment" unchecked, and thus extremely unsafe. While interpretation #2 makes sense in match blocks and partial-functions, where you expect to "fall through" to the next handler if it doesn't match, it doesn't make much sense in cases like this where there is nowhere to fall through to. By default, assume the user wants 1. "Help me extract the values from ..., and help me check that it's a tuple"
Require a special keyword if the user wants 2. "Help me extract the values from ..., and fail at runtime if it is not a tuple"
Could then verify that the pattern match is complete, otherwise fail at compile time. Most of the warts listed here are not inherent to the "core" of the Scala language: types, values, classes, traits, functions, and implicits. None of them are particularly deep, nor should they be very controversial. This list is obviously neither objective nor comprehensive. Nevertheless, these warts are annoying far beyond their level of sophistication, and especially pose a barrier to newbies (such as myself, six years ago) who haven't learned to "tune out the noise" and "jump through the hoops" to be able to work with Scala's elegant core. I don't have the capability to contribute fixes to all of these myself, but hopefully by publishing this I'll be able to raise awareness in the community about such problems, and add pressure so that some day all these sharp corners can be sanded down to reveal Scala's true elegance. If you have your own favorite warts in the Scala language, let us know in the comments below! About the Author: Haoyi is a software engineer, an early contributor to Scala.js, and the author of many open-source Scala tools such as the Ammonite REPL and FastParse.